Just got back from a ten-day prospecting adventure in Byron Maine. It was a really great time and for me ten days was not enough time. We had started our adventure on July 17, this time I had brought my wife Doris my son Charlie who is 8 years old the little girl who my wife baby sits for Nora who is 7 and my parents Alice and Maynard. There were also other family and friends that were meeting us at the camp ground, all had never prospected before. I had brought my sluice high banker dredge combo that I had mentioned in a previous post with me and I was very eager to try it out. I brought enough pans for every one to use of various sizes and of course shovels, buckets and so on. My jeep was packed to the hilt. My parents met at my house in New York, they live in New Jersey, and their vehicle was also packed. We left my house at 6am and arrived in Byron Maine at 2 pm, it was an 8 hour trip. We camped at Coos Canyon Campground and Cabins.Doris the kids and I rented a lean-to. My parents rented a tent site with electricity. We unloaded the vehicles and set up camp as soon as I was done with that I was down over the bank to the river in Coos Canyon to do some panning. Doris went over to the cabins to meet up with her sister Kathy who was spending a couple of nights in the cabin with her husband and daughter. Meanwhile another group in our party had arrived, family of ours from Maine Russ, Sue and their two kids Mike and Katie. They had a tent site in between us and my parents. While I was panning I did find a little color that was a good sign. I went to check on how every one was coming along with setting up their tents. We also had some other friends from New Hampshire staying next to my parents wich they had gotten there the day before us. We were all settled in, we ate dinner and had a nice campfire. I made my plans for the next day. I don’t know about everyone else but I slept great. I fell asleep to the sound of the river’s waters cascading over the centuries worn ledge rock and awoke to the same with the sun’s golden rays beaming down through the evergreen canopy and the smell of the lush pines and hemlocks. I got up got a fresh pot of coffee going on the camp stove and made bacon and eggs for the adults. My wife Doris got up and made blueberry pancakes for the kids. Then I started making preparations for the day. For all those who were interested converged on our camp site by 10 am. 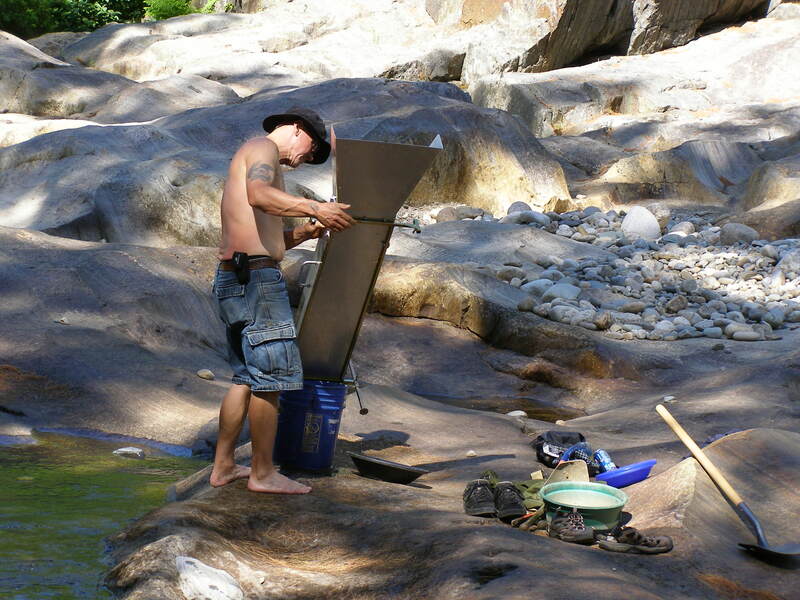 A group of us headed for the river with the sluice box, pans, buckets and shovels. Doris and I gave some panning lessons, and then a demonstration on how a sluice box worked. Some people panned while others dug in the riverbed and ran the material through the sluice box. The younger kids got bored with it and spent their time with swimming and catching minnows. We spent a good portion of the day at it and then we did our clean up. Not much gold just a few salt and pepper size pieces. We gave the gold to Chuck my brother-in-law because he had to leave that evening and we will get more gold the next day. It was a good learning experience for those who had never panned or sluiced before. After the prospecting it was back up to our camp site for a bar-b-que. We all ate good and then it was relaxation and conversation by the campfire with some good coffee. The following day Doris took a group of people down to the lower end of Coos Canyon for some panning and crevicing and swimming for the kids. While Mike, my dad and I went up river to where the East branch of the swift river ran into the main branch for some dredging. We parked the jeep along the main branch and we had to carry everything across the main branch to the East branch, we each had to make a couple of trips. There were a few prospectors already there sluicing and panning of course I had to go see how they were making out, they were finding some color. One of them was from Michigan the others were from Maine. It took a little time to get set up I had to put the dredge together. It’s a two and a half-inch dredge/high banker conversion kit that bolts up to my sluice box. I had added some ribbed matting that I had bought at Coos Canyon Rock and Gift, Rosey the proprietor has a good selection of prospecting supplies. While we were in there Rosey had informed us that on that past sunday a prospector dredging on the East Branch had found a five eighths oz. nugget and a good number of nice sized flakes. She showed us pictures of it and I swear it was over an ounce of gold. Well any way we got the dredge together and up and running, My dad tended the box while Mike and I took turns at the nozzle and moving the big rocks. I was very happy with the performance of the dredge. At the end of the day we had color in our pan. Mike is 16 years old, he was leaving the following day so we gave him the gold to take home with him, He thought it was a cool experience. The following day my dad and I worked the same hole, we found a little gold not much I decided it was time to move. The hole was about as deep as I could reach with just a snorkel and mask.I had moved our operation further up the East Branch. For the next couple of days we had dredged in this spot and now it was me Doris, my son Charlie and Nora. It was fun The kids had a chance to work the dredge we found a little more gold. There were a good number of prospectors in this area, some dredging, some panning and some others sluicing. 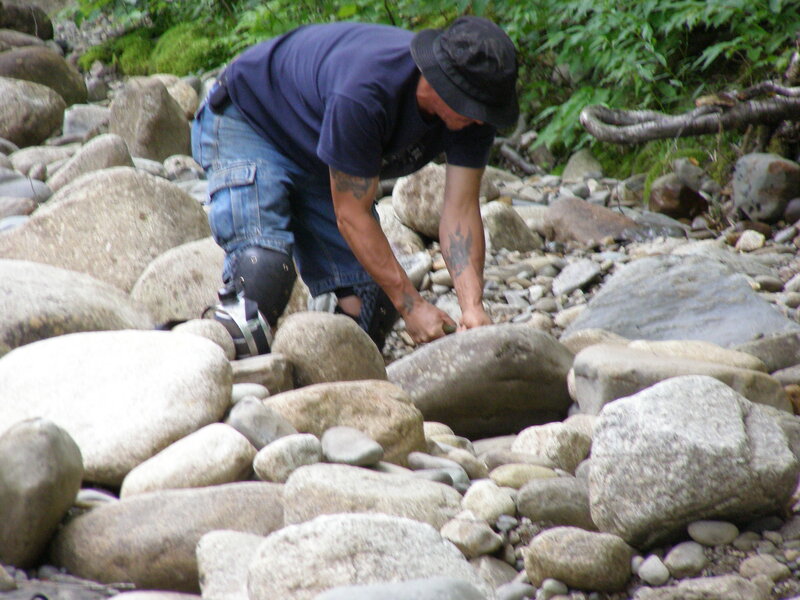 some were experienced well seasoned prospectors and some were first timers. I had a good time showing people how to set up their sluice box and how to pan, I enjoy the camaraderie, I also enjoy in sharing in the excitement of those that are new to prospecting when they find gold. The following day we had stayed down by the camp ground, we were expecting some more family to stop in to see us. 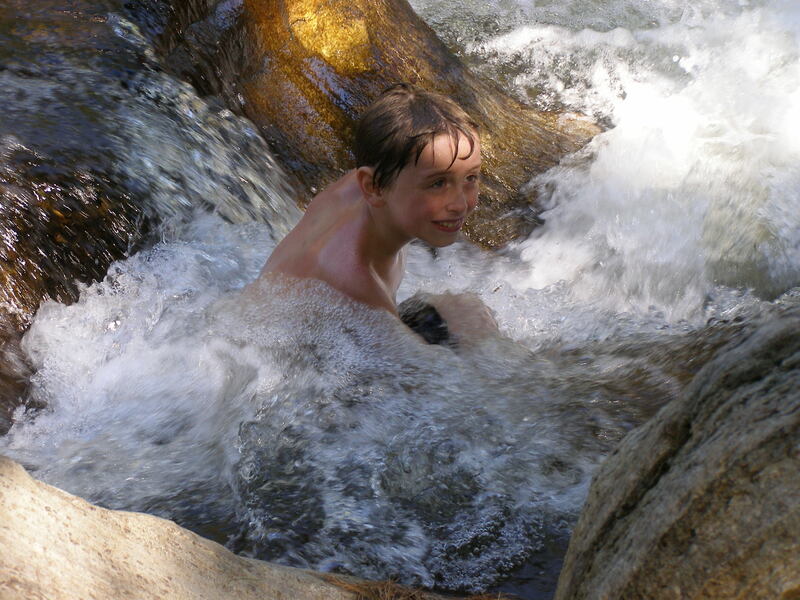 I did some sluicing in coos canyon while the kids swam. Doris sat on the ledge while making her jewelry. It was a beautiful day, the sun was shinning and we were all content. Kathy and Chuck found us, I put their son Scott to work shoveling while their daughters Erica and Gina enjoyed the water. They had brought a picnic lunch and drinks and that was greatly appreciated. 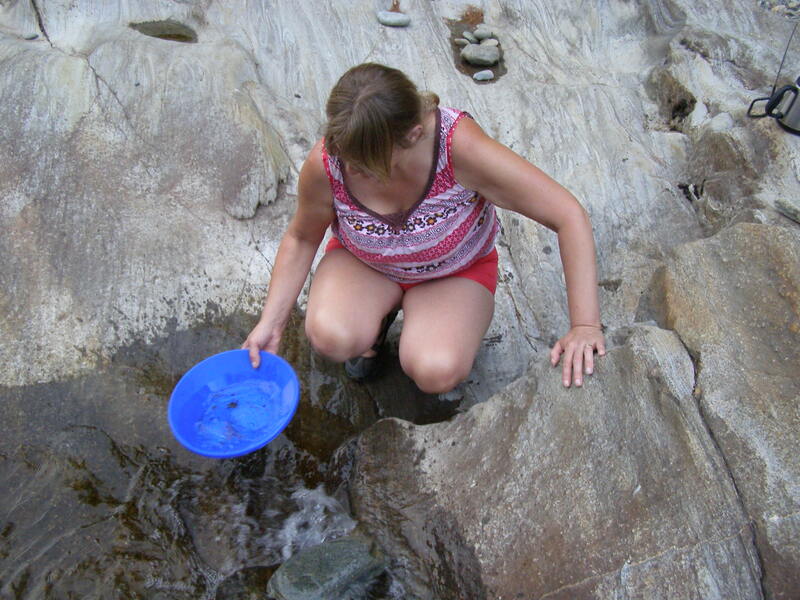 I cleaned up the sluice found a small bit of gold and we went back to the camp site. I wanted to try yet another area so the following day I went to a spot on the East Branch for some sluicing. This spot had some nice looking ledge outcropping. Found a hole that someone else had been working, dug a few inches more and hit bedrock. I started following the bed rock and this is where I found my best pieces of gold yet. Got a nice flake and several other small bits. We had one more day left I figured I should try the high banker out so that is what I did. I found some more nice pieces, I was very pleased with the operation of the high banker configuration. It figures though on the last two days I was starting to find the best gold. I should have started with this spot. Oh well next time. It was a great time and an experience I am sure the kids will not forget.